Samantha Martin is an imp, enjoying an extended vacation from Hel. All she wants to do is drink beer by the pool, play mischievous pranks on the humans, and get her hot neighbor in the sack. It’s a relaxing break from her infernal home as long as she manages to avoid the angels, who won’t hesitate to execute her on sight. 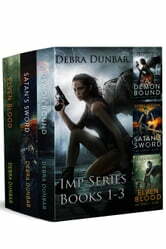 Samantha Martin is an imp, bound by an angel who allows her to live among the humans . . . as long as she follows his rules. It’s never easy for an imp to follow the rules, especially now that Sam’s brother, Dar, has found himself in hot water. He needs her help to retrieve an artifact from the vampires, or the powerful demon he owes a favor to will enslave and torture him for centuries. It should be a simple courier job, but with demons nothing is simple. Sam reluctantly attempts to help her brother, trying not antagonize the vampires or the demon gunning for him, all while chafing to comply with the restrictions her angel has placed on her as a bound demon. 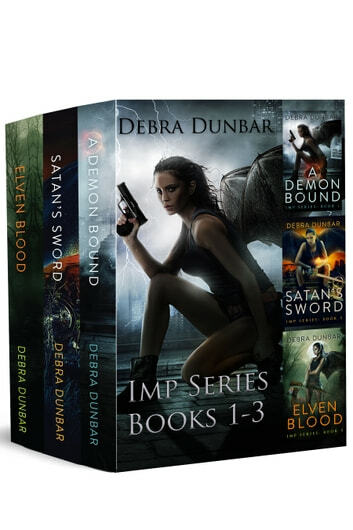 A fun urban fantasy series with a developed world and interesting protagonist. The plot is a series of adventures that nicely resolve in each novel without any cliffhangers. One of the best anti-heroines I've read lately,. Love the humour in these books and the great storylines. A most terrific set of tales. Why? The characters and action get you involved as you cheer for our main woman and guy. Suspend belief and revel in the exploits of Sam as she moves to her goals and stumbles forward in many directions. A worthy read! I purchased this book from Kobo. It popped up it "books I would be interested in". Alot of times they are wrong. This time, they got it right. Demons, Angels with a twist. Humorous and engaging. Read the first 3 fairly fast and am definitely going to get the rest . Good easy read.